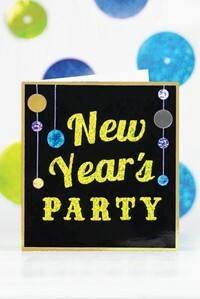 Project Description: Add some sparkle to your New Year’s Party Invitation and create easy to make garland with Grafix. Make 5″x5-1/2″ side-fold card from Gold Foil Board. Cut 4-3/4″x5-1/4″ panel from Black Foil Board. Cut “New Year’s” from Yellow Sequins Funky Film using electronic cutting machine. Cut “Party” from Yellow Sequins Funky Film using manual die-cutting machine. Remove liner from film letters and adhere to black panel. Cut three lengths of thread. Adhere thread ends to back of black panel and wrap over top edge as shown. Punch assorted circles from films, remove liners, and adhere over threads to create vertical garlands. Trim as needed. Adhere black panel to card front. Die cut garland circles using 2-2/8″ and 3-3/4″ circle dies. For each circle, precut one piece of foil board and one piece of film slightly larger than die size. Position film and board back to back with shiny sides facing out; die cut. Keep each pair together. Repeat to make at least five circle pairs per each garland strand. To string garland, cut 18″ length of thread. Peel liner off film on first circle pair; position sticky side up on work surface. Position 1″ of 18″ thread onto sticky surface. Cut 5”-7” length of thread; position 1″ of thread onto sticky surface, opposite of first thread. Position foil circle shiny side up onto sticky surface. Tip: Having trouble cutting Funky Film in your Silhouette machine? Try using it without the platform.